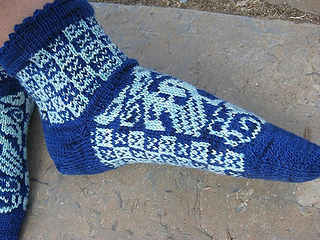 Swedish stranded knitting patterns are often more elaborate and intricately detailed than Norwegian patterns and often use red and white. The patterns may include motifs with pairs of birds combined with hearts, as here, or a ring of dancing people. 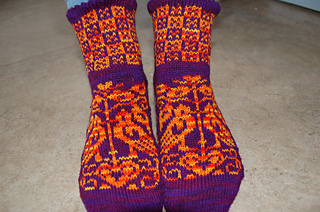 Change needle size & gauge to make the two larger sock sizes.